Teenage Rebecca Brown feels completely out of her element when she leaves her home in New York City to live in New Orleans while her father is away on an extended business trip. She's staying in a run-down old house in the Garden District with her Aunt Claudia, who reads tarot cards for a living, and her little cousin. Her new school is an exclusive prep school, and the girls there are too caught up in the social hierarchy of the popular vs. the not-so-popular girls to want to spend time with someone who's not only an outsider, but also temporary. Rebecca is trying her best to do her time, not get involved, and get back to New York as soon as she can. But one night she follows some of the more popular kids when they are sneaking into the cemetery near her aunt's house. There she finally makes a friend - not one of the popular kids, but a young African-American girl - who turns out to be a ghost. From that moment Rebecca finds herself becoming more involved with life in New Orleans, as she comes to learn about a mystery involving a curse that reaches back through the years but is still very much connected to the present. This is a fun ghost story, full of the atmosphere of New Orleans, with a dark and disturbing mystery as well as a dash of romance. The secondary characters are a bit stereotypical, particularly the "bad guys," who are just a little too over-the-top evil and heartless. Rebecca's dad never seemed quite believable in his actions, either - his behavior simply didn't make sense to me in the light of later revelations in the story. Still, I did enjoy the evocative setting and the ghost story that stems from the fascinating history of lovely New Orleans. 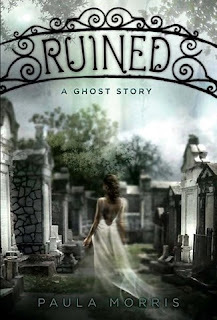 Books and Other Stuff: "Ruined is categorized as a Young Adult novel, but as an oldster, I enjoyed it. It was well written and informative. Morris also captured the pettiness of teens, which made me squirm." 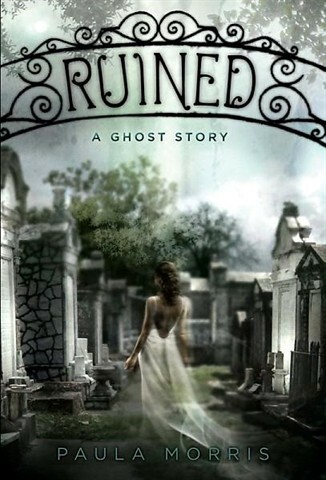 Carrie's YA Bookshelf: "I love ghost stories, so this one was right up my alley. Morris' writing is eerie and suspenseful, which creates an atmosphere where you never really know which character is friend or foe." Today I read...: "Overall, the book was a fun and quick read. There is a dark element, but nothing entirely frightening." I have seen this reviewed a few places and it looks rather good. I might have to give it a read at some point! I have had this book on my wishlist forever! It's one I was interested in but didn't want to dish out the stupid amount of money they wanted for the hardcover. I'll bet it's in pb now! I wonder if my crappy library might have gotten in because it's old now? ;) Since you liked it, I really want to read it now! Kailana - It might be a good choice for R.I.P., if you plan on joining in the fall. Cat - Shelling out for hardcover is painful! I hope your library has it - it's good but I don't think I would buy a copy (although I have to admit I rarely purchase books at all anymore, except sometimes for my Nook). I mentioned you in my video blog! And then I totally spaced on your blog name and look like a fool. Ha! Long story short - I got the second book from Paula Morris at an event yesterday so I actually went and BOUGHT THE HARD COVER of Ruined to match it. Heh. I am that lame. Cat - Oh, that is funny - I am off to check it out. I appreciate it because I am SO bad with names in general. :-) You splurged for the hardcover, eh? Because you love your books to match, right? I love it!